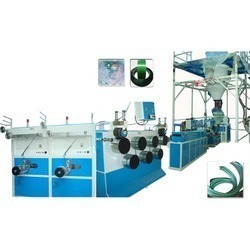 We are engaged in manufacturing, supplying and exporting a wide assortment of PET Box strapping Machine to our reputed clients. Our offered extrusion line is mainly used in package areas, used to produce polyester strap, etc. This extrusion line is manufactured using high quality components and advanced technology and is checked at different stage of manufacturing under the supervision of professionals experts. We "Extrumac Engineers", situated at Ahmedabad (Gujarat, India), have gained strong foothold in the field of Manufacturing, Exporting and Supplying high performance range of PP Box Strap Extrusion Line, PET Box Strap Extrusion Line, PP String Sutli Extrusion Line, PP HDPE Monofilament Extrusion Line, etc. Managed under the headship of our Proprietor “Mr. Rajesh Panchal”, our company has gained huge success across the globe. Since our inception in 2002, we have been supported by State-of-the-art infrastructural base that comprises functional divisions such as Procuring, Production, Quality Testing, R & D, Warehousing & Packaging and Transport & Logistics. All divisions are resourced with requisite facilities and work under the administration of highly experienced professionals. Our easy payment mode, focused approach, prompt delivery and vast distribution network have enabled us to attain maximum client satisfaction. Additionally, we mostly export products to Gulf countries and South Africa.